Slate are safety boots with true character, finished in a full-grain waxy black leather. Extremely robust and surprisingly lightweight, these boots come with a composite toecap and protective composite midsole – they are 100% non-metallic. Complete with a 100% waterproof and breathable Activ-Tex® membrane, these boots keep the conditions right for your feet to improve comfort for longer, the dual-density outsole also helps to ease pressure on your feet. 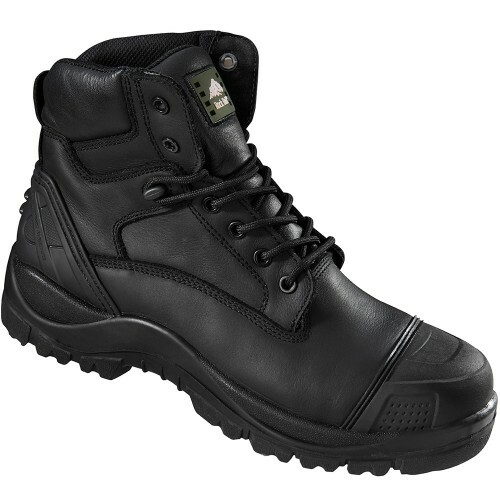 The sole of these boots is slip resistant to SRC standard, and the TPU scuff cap provides the highest durability and abrasion resistance properties. The standout feature with the Slate boots is the advanced Dual Footbed System which allows the wearer to decided between two foot beds, one foot bed for uneven ground providing arch support and increased ankle support, the other footbed provides support for hard ground, giving enhanced shock absorption and the highest level of anti-fatigue properties. The Slate boots are also wide fitting and have anti-static properties which completes what are one of the most advanced safety boots on the market.